One of my favorite things is getting the Christmas decorations up around the house. I don't go too crazy, and do too much. I concentrate on our living room, since that is where we spend the most time. I'm excited to share my winter mantel today. 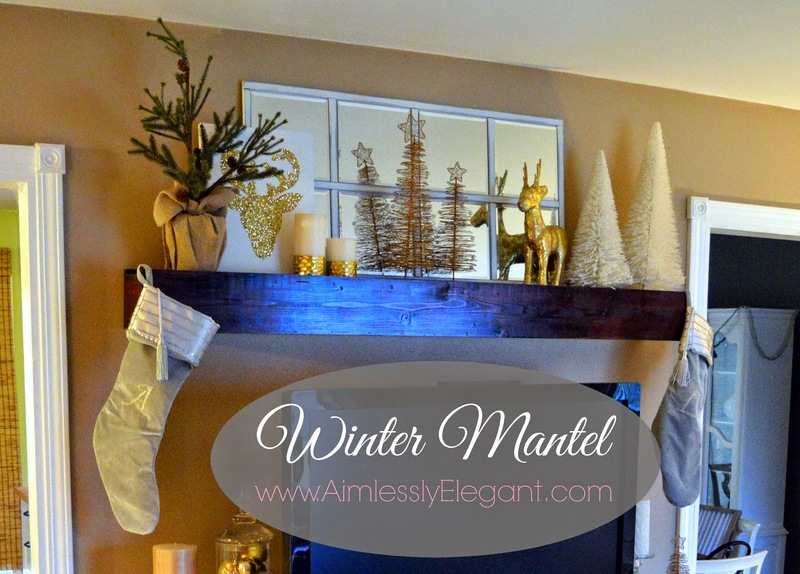 I first built my mantel last year at this time, just because I was sick of not having something to decorate with the holidays and seasons, but most of all I was sick of not having a place to hang stockings! The important things! This year I stuck really neutral with my colors, white, gold, and sliver. I was going for an elegant rustic look. Not too rustic, just a little! Most off of my decor has been snagged in previous years after Christmas Sales. I love stocking up on new Holiday decor then, and then when you bring it out next year its like a brand new treat, some of which you don't even remember having! I kept my DIY Window Pane Mirror up there, and then just built around that with what I had. The tree was from Pottery Barn last year. The only thing I'm bummed about is it's supposed to light up, and I should have tested it right away when I bought it, but I didn't, I just tucked it away in storage. Only one of the lights lights up! At least it still looks pretty! My glitter reindeer was an easy DIY. I just took a black canvas, some glue, glitter and a template and went to town. 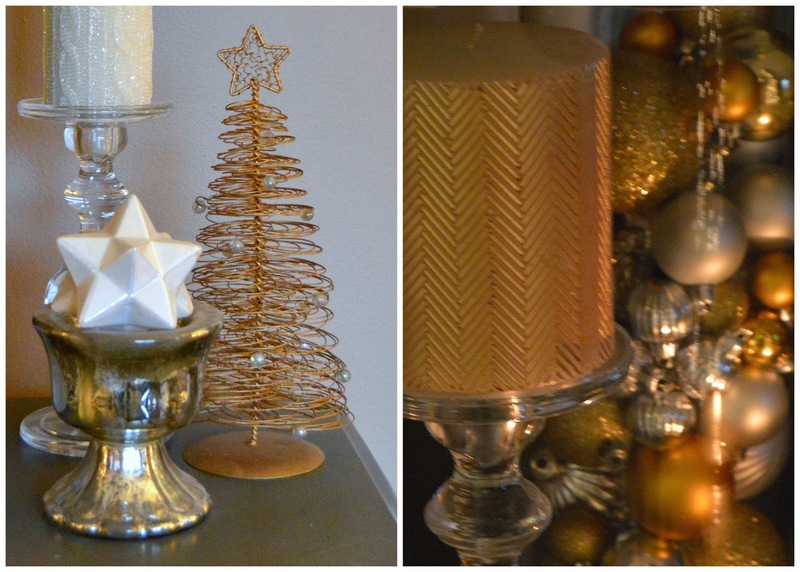 The hammered gold candles were found last year at Target on clearance after the holidays. My gold trees are from my Pier 1 days. Right after college I worked at Pier 1 for awhile, and it helped my home decor grow tremendously! My gold reindeer I picked up at Micheal's last year for just a couple of bucks, I saw them there again this year. And my awesome fluffy white trees where an after Christmas find at Crate and Barrel years ago. They have a slight shimmer to them, I love them. I tied in down below with a few things on either side of the TV. It's easy to stick with groups of 3, just make sure you vary the heights of the items you mix together and it will look great. Do you tend to stick with a theme when decorating? What's your method? Up next, the tree! Your mantle is adorable!!! I love the mirror behind everything, too. Where did you get that wire gold tree? I just saw those at a wedding recently and I thought they were super cute! I love that glitter reindeer!!!! I really need to step up my DIY's that adds such a pretty amount of sparkle! Love all your decorations! I focus all my attention on the living room too! This is gorgeous!! Love the glitter deer print! 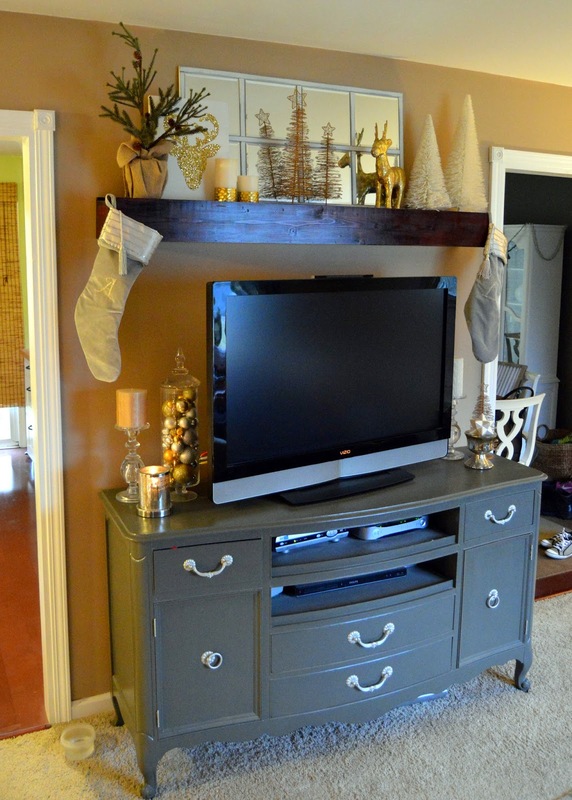 You seriously have a gift for decorating mantels - yours is absolutely beautiful! I'm loving your color scheme. It looks soooooooo good! And how is it that I'm just now learning that you built your own mantel? 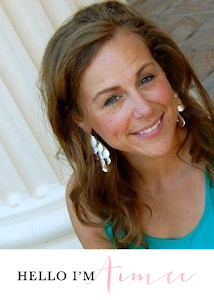 Not that I'm surprised since you're pretty much the queen of DIY success! Love that you've pieced it all together over several years...and made it look so cohesive like you bought it all at the same time. Can't wait to see your pretty tree! Thanks! I'm so glad I made that mirror, it has been a staple in my mantels ever since. The gold wire trees I got at Pier 1 years ago, but I know I've seen similar ones there in recent years so you may have some luck! It is seriously the easiest DIY ever, I think it took me all of like 5 minutes to trace a reindeer cut out, paint it with glue and douse it with glitter! Thanks! It just makes sense since that where we spend all of our time, right?! Thanks! That is one of my favorite and easiest Holiday DIY's! I get sucked into those colors every year, they just feel so holiday and elegant to me! Your too sweet! I think each one just progressively gets a little better the more I do it. Do you have a mantel in your new home to decorate? It actually was pretty easy to make, I just followed plans from Ana White, and modified them a bit to fit the size I was looking for, but it's basically just a hollow wood box hung up on the wall. I haven't added to my holiday collection in a few years, but I'm feeling itchy for some new things! I do! I had one in our rental house, too, but I just never felt that inspired to decorate it. That definitely won't be in the case now! Awesome! I'm dying to see pictures of your new home! Love how fun and festive your mantle is with all the glitter! Umm, gorgeous! Good call on buying decor after Christmas - everything is probably sooo much cheaper! Your mantel is beautiful, love the gold details!! Thanks Cait, I can't get enough of the gold this year! SO much cheaper, I hope I can add to my collection this year! Gotta take advantage of this time of year, when else can you get away with so much glitter? !